The NMCI provides Team Building courses to suit clients from all areas of industry. 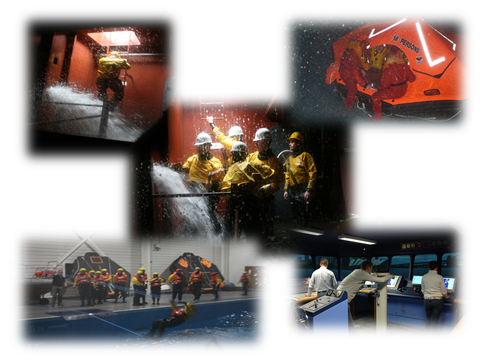 These courses can involve group exercises in our environmental pool, damage repair unit and our 360° full-mission bridge simulator. This high end team building program involves both outdoor and indoor challenges and problem solving. Team Building is an important task for any manager. One can always assemble a team, but building a team to perform at its best is not the easiest of tasks. That’s why we at NMCI offer a team building day at our state of the art 10 acre campus in Ringaskiddy, Co.Cork. An array of activities can be offered as part of the Team Building course at NMCI which will meet the needs of each individual client. Our course offers your team an opportunity to improve listening, communication, adaptation, confidence and leadership skills, just to mention a few. We can simulate heavy weather conditions in our Environmental Pool i.e. thunder, lightning, rain, wind and waves or have your group navigate a complex set of shipping channels in our “Class A” 360° Degree full mission bridge simulator. All our team building activities require quick thinking, high levels of communication and team work due to the rapid nature of the day’s events. Remember no matter what industry you and your team work in we can tailor a specific team building day to meet your needs. With a varied level of activities and an array of wet events to choose from you will be spoilt for choice. 2. I’m a casualty, get me out of here!